The StereoGraphics SynthaGram™ Glasses-Free 3D monitor provides extremely clear, bright, and crisp Stereo3D still and moving images, without the use of special eyewear. The SynthaGram monitor is especially suited for wide-angle electronic 3D signage and exhibits in public spaces such as In-Store Retail Displays, Tradeshow Booths and Interactive Kiosks, Arcades, Museums, Gaming, Theme Parks, and Corporate Lobbies. 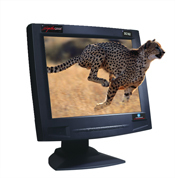 The SynthaGram 222 is the highest resolution 3D LCD monitor available at a phenomenal 3840 x 2400. This monitor is the cutting edge in autostereoscopic technology and offers exceptional 3D images for scientific/medical users and wherever the image clarity is critical. The SynthaGram 202 is our mid-range monitor with high resolution (1600 x 1200). It can be used for both desktop and countertop displays such as Retail Point of Purchase or Tradeshow Booths. The SynthaGram 182 has a resolution of 1280 x 1024, and is designed for desktop displays and special applications such as arcades and gaming.